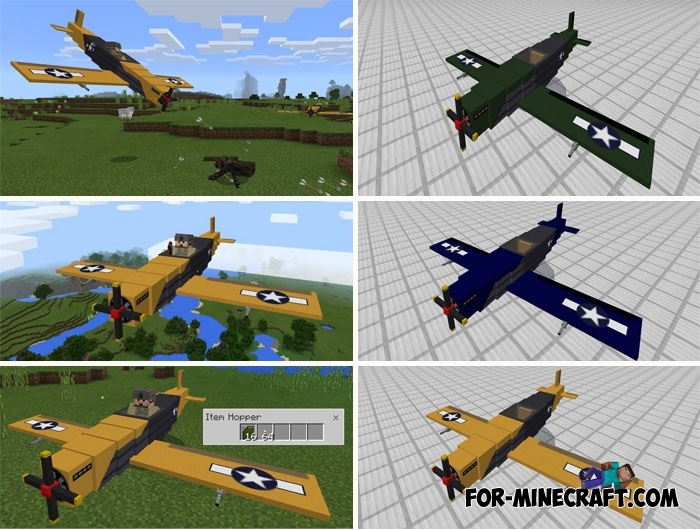 War Plane Addon contains 4 different aircraft of the last century equipped with a fighting machine gun to Minecraft Pocket Edition. The plane does not require a runway so you can park it next to your house and take off at any time whenever you want. Agree that the aircraft is suitable for travel better than ordinary running. But for further flights you will need special aviation fuel (snowballs in the past). With this fuel, the aircraft can fly any distance in any direction. [Creative mode] Take a chicken spawn egg and throw it to the ground. Then go to your plane and press the ride button. The aircraft has its own inventory where you can store fuel for example. This is the fastest way that you can use to test the aircraft. [Survival mode] Using this method you will have to look for chickens, or rather spawned aircraft. They can be anywhere in the ordinary world, which will take you literally 3 minutes. Once you find the plane, do the same thing as in the first method. In this version of the War Plane addon, the aircraft independently attacks any enemy targets that are close. The stock of arrows is infinite, but the plane can be destroyed after all health is over (100 hp). The most important thing is do not forget to fill your friend or your flight is over very quickly.